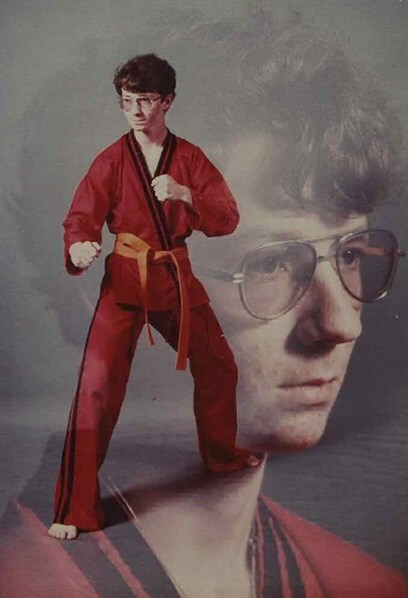 PTSD Karate Kyle falls under the category also inhabited by PTSD Clarinet Boy and Vengeance Dad. All of these memes focus on the subject having a haunted and violent past, and the text accompanying the images outlines various violent methodologies for dealing with day to day things and events. PTSD stands for Post Traumatic Stress Disorder, and is a common symptom exhibited by those who have experienced severe trauma in their lives. Often it is a hallmark of military service in areas where there is extreme bloodshed and violence. The incidences of PTSD in returning Vietnam veterans were extremely high. While it is understandable to see PTSD exhibited in returning war veterans, the humor from the memes comes from superimposing an imagined past in people who would be very unlikely to have witnessed atrocities that cause the development of PTSD symptoms. Hence PTSD Karate Kyle. The photograph in and of itself is very humorous to begin with. The 1980s style photo superimposed over/next to another photo look which was ubiquitous in that decade is present here. When posing for photos of this nature, it is common for the photographer to tell the subject to remain serious, so they can capture different sides of the person. In this case the result was funny, not serious. The photo in question was originally posted to the Facebook page of James Von Helton. It eventually spawned the meme. Notable examples of versions of the meme include the photo with the text: “They shoved me into my locker – I shoved them into their graves”, and “They laughed when I wore my glasses – I laughed when I wore their skins”.